Let there be engraved a circle round the crystal with these characters around inside the circle next the crystal Afterwards, the name “Tetragrammaton”. 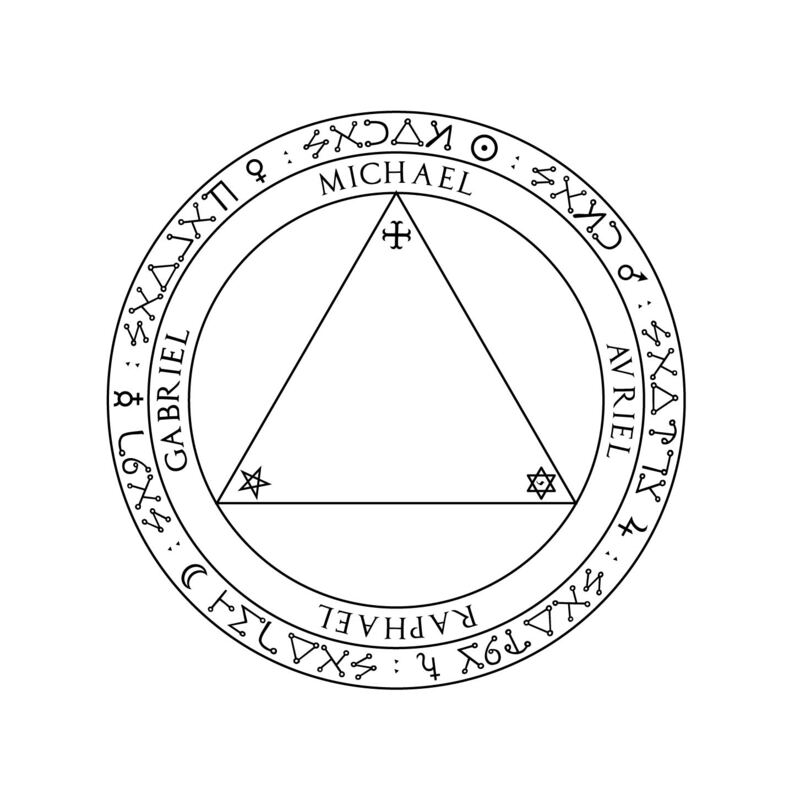 On the other side of the plate let there be engraven “Michael, Gabriel, Uriel, Raphael”, which are the four principal angels ruling over the Sun, Moon, Venus and Mercury; but on the table on which the crystal stands the following names, characters, &c. must be drawn in order. The setup Trithemius uses requires four tools: a crystal ball, an engraved gold plate to set the crystal in, an ivory pedestal to support the gold plate and crystal on the Table, and the Table of Practice itself. Since I find myself lacking in gold and ebony to throw at projects, I settled for just making the Table of Practice itself, which is how my teacher suggests. Having the whole setup would look similar to this awesome set of tools, over at A Magician’s Workings. Although having the complete setup would probably be more suggested, a basic Table of Practice and crystal set atop it works fine for me. It’s got the names of the planetary angels on the outside written in Celestial with the appropriate planetary symbol on the outer ring, the names of the four angelic elemental kings on the inner ring, and then the central triangle. I ended up using Adobe Illustrator for this since I was failing at freehanding the text and symbols appropriately, even dividing out all the space radially for each letter and symbol. Ah well. 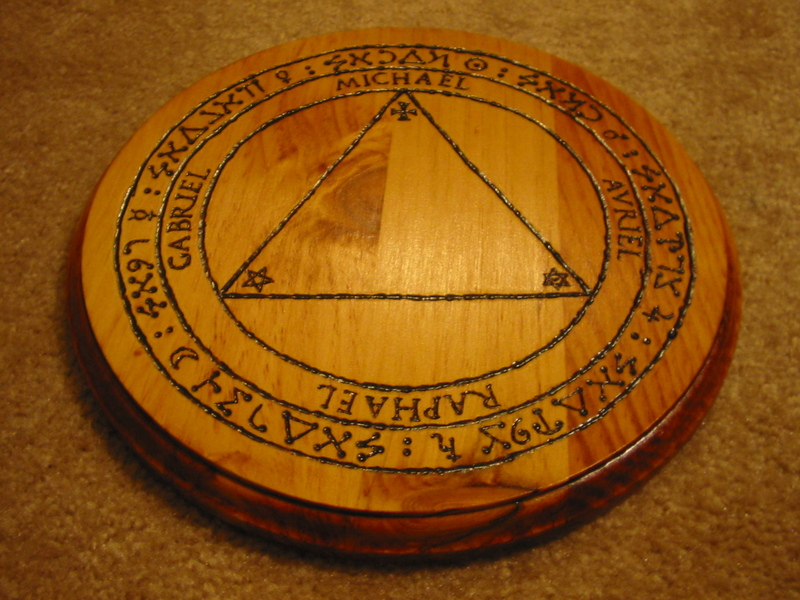 The original design had the name TETRAGRAMMATON inscribed in a circle around the triangle, but I decided to scrap that since it was too much work and added more clutter to the Table. Eventually, I got my needed supplies from a Michaels: an 8″ circular wood plaque, a woodburning kit, wood stain, wood finish, brushes, tracing paper, and fine-grit sandpaper. Since I was living alone at this point, I appropriated the living room and coffee table for this project. After getting everything together, it was just a process of tracing the design onto the wood, woodburning in the symbols, sanding down the wood to get it smooth enough for staining, applying stain, letting dry, sanding, repeating the staining, then applying finish, letting dry, sanding, and another layer of finish. With all that done, the Table of Practice was complete and ready for use. All in all, the project took about three days: one for planning the design and getting it traced and burned onto the wooden plaque, one day to do the staining (three coats at six hours apart), and one day to do the finishing (two coats at eight hours apart). Looking at the completed project, I can see much room for improvement, but no major errors were made and I’m pleased with the result. Besides, this was my first woodburning project ever, so for a beginner’s level, this isn’t too shabby. The spirits I’ve been working with don’t seem to mind, at any rate. I haven’t found a consecration ritual for the Table of Practice, though, so I made up a quick little thing where I sprinkled holy water on it, suffumigated it in incense, and said a brief prayer asking that it be cleansed, purified, and sanctified to every purpose to which I’ll use it.